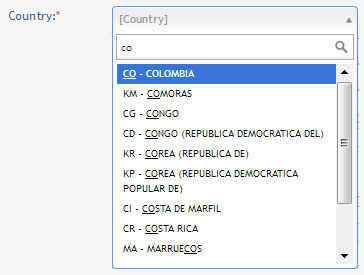 We have a dropdown list that allows for the selection of up to 24 city names. I'm trying to make the case to change that into a combo-box, which would drop down to a suggested top 10 elements, and allow users to type a few letters in order to get a more accurate suggestion. It would also allow us to add an infinite amount of city names, a feature that would be nice for later. Some people in my team worry that this may confuse users, and that it adds the need to interact with the keyboard when the dropdown way allows interaction with just the pointer. Are there clear guidelines on when to use which ? Data to populate the list may come from a database, so you may have unlimited entries to the list and the user won't get lost and tired of browsing the list. The user have plenty of options and any of them will allow to select the option. A Combo-box is combination of selectbox and text-field, In this case user can either select a city or search and select a city. A Dropdown button is a menu button, the list items in the menu button has a unique features, either the list items opens a dialog/tab or have some actions. Not the answer you're looking for? Browse other questions tagged dropdown combobox or ask your own question.